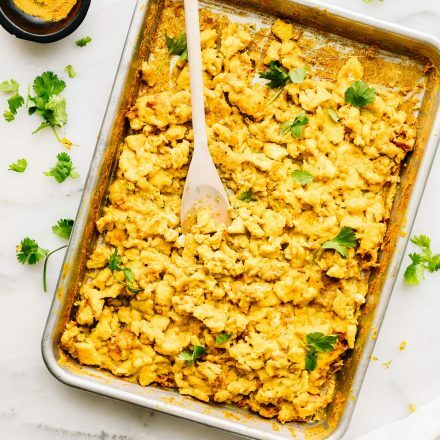 Kick Start your day with this anti-inflammatory breakfast recipe for Turmeric Oven Scrambled Eggs. Optional toppings – Cilantro, avocado, salsa, cheese, etc. Whisk eggs, milk, turmeric and other spices together in a larger bowl. Gently pour egg batter on an oiled sheet pan (or in large casserole dish). Place in oven for 10-12 minutes or until eggs have started to set. Remove or gently pull the out the oven rack, stir eggs on the sheet pan with wooden spatula, then slide back in oven. Place sheet pan back in oven for about 8 – 10 minutes or until eggs are set and semi soft for scramble eggs, to your liking. Remove from oven stir again with spatula. Serve hot with toppings, like peppers and cilantro. Or store in airtight container for up to 4 days. *Alternatively, you can bake the eggs for 15-17 minutes without scrambling and then slice into baked eggs squares. Optional toppings – cilantro, peppers, avocado, salsa, etc. To clean the Turmeric off the pan, simple soak in baking soda or bar keepers solution. It comes off very easy and should be simple to clean if you greased or oiled the pan prior.